WOW Air, a low cost airline that has been operating out of Toronto and Montreal since 2016, has added Vancouver as the third Canadian city to their route network. Similar to Icelandair, which is their main competitor, WOW Air uses Iceland as their home base, and offers connecting flights to a large variety of destinations in Europe, as well as flights to Tel Aviv, Israel and New Delhi, India. The new flights from Vancouver will start in June 2019. Based on what I've seen out of Toronto and Montreal over the years, this will likely lead to very competitive fares for non-stop flights from Vancouver to Reykjavik, Iceland. WOW Air's flights to other destinations in Europe can also occasionally be a great deal. To Tel Aviv, Israel and New Delhi, India it's less common for their prices to drop into great deal range. Although Vancouver doesn't usually have too many cheap fares to Tel Aviv, so there may be some bargains here. 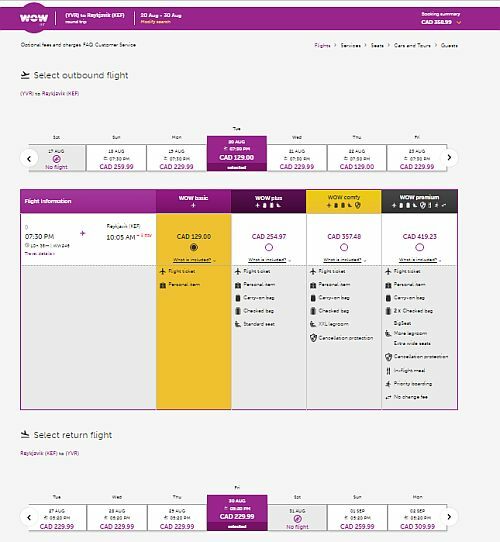 With all of WOW Air's prices, you really need to do the math first before getting sucked into their marketed prices, like the '$129 flights from Vancouver to Iceland' banner you'll currently find on the WOW Air website. As is becoming the case with more and more airlines, WOW Air's lowest prices include essentially just a seat on the plane, and a personal item (something that can fit under the seat). Carry-on and a checked bag have additional fees, and with WOW Air, these are not insignificant fees. You can have a look at WOW Air's bag fee page to calculate what they will cost. A carry-on bag with WOW Air will run you $140 CAD roundtrip. A checked bag will be $180 CAD roundtrip. Be sure to factor in these costs when comparing against other airlines, which may already include a carry-on bag or a checked bag with their prices. NOTE: Currently, when you go to the WOW Air website, and you select the 'Departing From' dropdown banner, you'll find Vancouver near the very bottom. I'm sure they'll eventually add it to also be listed underneath Montreal and Toronto near the top. 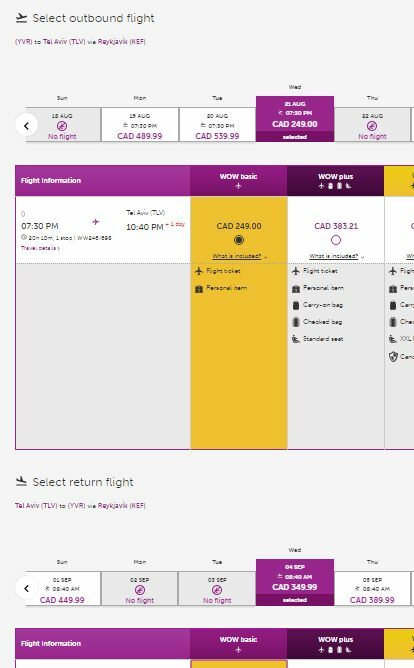 Are there any good introductory fares being offered by WOW AIr from Vancouver? These are WOW Air's only non-stop flights from YVR. All other flights connect through Iceland. You can currently find flights in June 2019 for as low as $329 CAD roundtrip. But, as I mentioned above, after you add in the cost of a checked bag, it becomes a $500 roundtrip flight. This is still quite a bit better than the only other non-stop flights from Vancouver to Iceland, which are through Icelandair, and are currently going for $650 roundtrip + another $125 or so for luggage, or $775 roundtrip. There are also some cheaper ones from Vancouver to Reykjavik, Iceland in the second half of August, on a few dates, such as August 20 to August 30 for $358 CAD roundtrip (no luggage price). These prices can also be found in September 2019. - There are a few cheap one way flights from Vancouver to places in Europe for $199 CAD (no luggage) - but most of their roundtrip prices are not currently super exciting, especially once you've factored in the luggage. This is often the case from Toronto and Montreal as well. There are a few flights in June 2019 from Vancouver to Amsterdam or Sweden for $399 (no luggage) to $579 (checked bag) roundtrip. You may find some prices in the second half of August that are a decent price relative to typical August prices from Vancouver to Europe. - You can find some 'no luggage' prices from Vancouver to Tel Aviv for $599 CAD roundtrip, particularly in late August and September. So $780 roundtrip with a checked bag. Quite good relative to the usual $1100 roundtrip pricetag from Vancouver to Israel with most airlines, and I'd say the best deal of all. - To New Delhi, India I haven't seen anything too exciting. This is usually the case from Toronto and Montreal as well. Flights start at around $780 CAD roundtrip, or $960 roundtrip with a checked bag. europe, northern europe, scandinavia, western europe, dublin, ireland, dub, united kingdom, london, reykjavík, iceland, kef, stockholm, sweden, arn, amsterdam, ams, netherlands, lgw, articles, asia, paris, france, cdg, tel aviv, israel, tlv, reykjavik, india, south asia, del, the middle east, new delhi, gatwick and wow air.